Description: Hand signed and dated twice and inscribed 'FOR XAVIER - Keith 88 K. Haring SEPT. 5-88' (on the overlap). The scene depicted within the painting is consumed with energy and activity. A monstrous figure is pulled out of a hat, while an animated silhouette topples over with surprise. 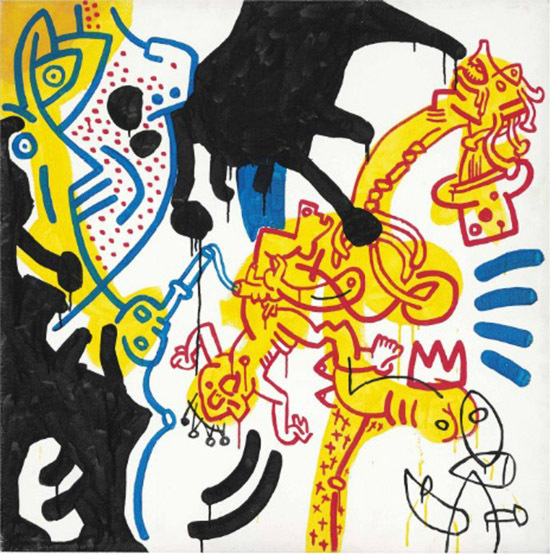 Using basic lines and universal symbols, Keith Haring created a kind of personal, pictographic vocabulary that is at the same time humorous and serious. The three-pronged crown, which his friend Jean-Michel Basquiat often used to sign his works, is found in the bottom-right corner, a poignant reminder of his friend, less than a month after Basquiat’s tragic death. To the right of the Basquiat crown, lines radiate out with movement and life energy. These radiating lines denote the basics of drawing and cartooning that underpin Haring’s oeuvre. VonderBank and Christie's Stickers on the Verso.